So was the king of rock’n’roll Elvis Presley an adorable person, worthy of respect not only from female teens but also from young men and adults, rich and poor, blacks and whites.? And did he late in his life undergo a double ‘born again’ moment after a visit from evangelist Rex Hubbard? January 15 of this year would have been his eightieth birthday, a date that kick-starts a whole year of Elvis events across the world. And so will come the books. 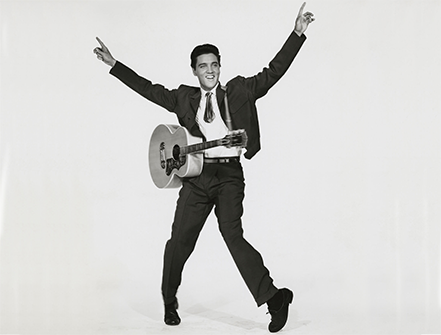 One early claim for attention is Elvis Presley – A Southern Life by Joel Williamson (Oxford). The writer is known in the US for landmark books on Southern culture, and is the Lindberg Professor Emeritus of the Humanities at the University of North Carolina. It’s a good read, more journalise than academic in style, loaded with insights and data, and written in such a way that you might for a moment think that Williamson was actually there in Germany helping Elvis to write his love letters to Anita Wood, and insisting she remained “clean and wholesome.” or the time when in some anger he left a dinner with Priscilla his wife, and dad Vernon when they dared lecture, him on his spending habits, and as he forcefully reminded them they benefited from his earnings, or visitations of fourteen year old girls to his bedroom, but it seems all you had to do was shout ’stop’ and he did, or details of his huge gun arsenal, or the need for Elvis to tour at a killing pace to maintain the revenue stream upon which everyone depended, and this even when Elvis’s increasingly sick and obese body and distressed psyche threatened to de-rail everything. From this you would be right in thinking that Williamson’s book is rich in gossip and stories. Some facts will dismay, especially descriptions of the often brutal treatment meted out to those who got in the way or annoyed his huge protection squad. audiences were embarrassed by his chatter between songs where he seemed to desire the audience to approve of what he was doing in his personal life..
What is clear, at least to this writer, is the simple fact that many of his religious song recordings are deeply moving. Williamson has nothing to say on this, but then to repeat this is a book about Elvis the person, not Elvis the record hit-maker.. On that score, albeit in a literary manner , the former is simply that Williamson has enough almost salacious material that could fill a Daily Mirror or Sun for a year or more. However what of the other question? Could he find a congenial place alongside Dylan and the Beatles – when it comes to deciding who should be at the top table of rock and pop artists? 0n the latter question many a rock chronicler like myself will argue that Dylan and the Beatles had one particular thing in common – both had the knack of picking up on general trends, synthesizing music out of them, creating perfect statements of the moment. Not so for the king of rock ‘n’ roll. Elvis Presley. He simply sang about the kind of things that make sense when you are young. Presley of course differed from say a clean cut smooth Pat Boone who along with the King in the 1950s kept having major chart hits.. Presley annoyed parents. The UK teenage new star of the late 1950s Cliff Richard did his best, to come somewhere near in adopting a Presley snarl of the lip, and some hip movement. For a brief period Cliff made parents bar their innocent offspring from his concerts. However in common with the times he soon became a family entertainer and made innocuous fun films. Admittedly Presley would be pushed into movie land, and seemingly he had a` desire to be a great actor, but according to a new book on his life he spurned thoughts of even elementary drama training and technique. Hollywood adapted accordingly – there was lots of money to be made. It seems no one had the courage to suggest he was not a very good actor. 27 films were made over eight years. You can of course place Presley in a racial context, at least in upbringing and early music. in that he, a white singer dared to sing black music, and for the many in the non-white community, he was good. This was the early 1950s . He would arrive at a fascinating time in music, for the 50s decade saw a fusion of R&B, hillbilly, gospel and pop and oh, stir that lot up and you got rock ‘ ’n’ roll . Step forward a dynamic singer Elvis Presley. And how the young adored, and parents shouted anger. Vintage Rock (Jan/Feb) is one of many current magazines to devote oceans of copy on this memorable artist, and among its comments there is one that says that the big beat would have existed without Elvis, but the form it took and the images that embody the spirit of rock ‘n’ roll, all flowed through the man from Memphis. He recorded a massive catalogue of hit songs. Previously carried in The Methodist Recorder.